- Includes 5 minifigures: Lex Luthor™, Batman™ (in Rebirth Batsuit), Wonder Woman™, Firestorm™ and Cheetah™. 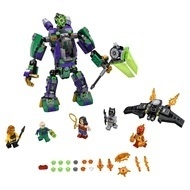 - Lex Luthor™ Mech features an opening minifigure cockpit/escape pod, posable legs, arms and fingers, adjustable 6-stud rapid shooter, buildable axe, attachment points for 3 collectible Energy Infusers, plus an attachment point for the Kryptonite prison featured in 76096 Superman™ & Krypto™ Team-Up. - Mech escape pod has foldout wings, an attachment point for an Energy Infuser and 2 detachable guns. - Bat-Glider features an attachment point for the Batman™ minifigure, 2 stud shooters and translucent-yellow light-style elements. - Includes 10 assorted translucent-orange Power Burst elements to customize your builds and minifigures. - Also includes the buildable green Energy Infuser. - Attach the buildable red and blue Energy Infusers from the 76096 Superman™ & Krypto™ Team-up and 76098 Speed Force Freeze Pursuit sets to the Lex Luthor™ Mech. - Weapons include Batman's Batarang, Wonder Woman’s lasso and Cheetah’s spear. - Batman™ (in Rebirth Batsuit) minifigure is new for January 2018. 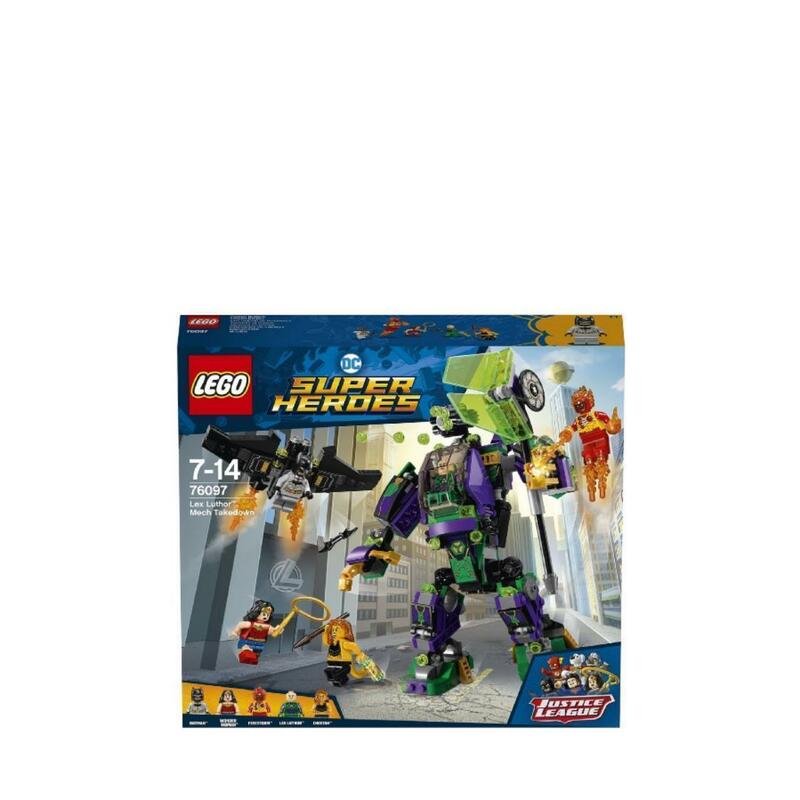 - Connect the 76096 Superman™ & Krypto™ Team-up Kryptonite prison to the Lex Luthor™ Mech for even more Justice League action. - This superhero toy for boys and girls is suitable for ages 7-14. - Lex Luthor™ Mech measures over 7” (19cm) high, 1” (5cm) long and 4” (12cm) wide. - Escape pod measures over 2” (6cm) high, 1” (4cm) long and 1” (4cm) wide. - Bat-Glider measures over 2” (6cm) high, 1” (3cm) long and 4” (12cm) wide.